Since I moved to Berlin I’m always trying to find new photo locations and best places to take pictures in Berlin. Where do I find good architecture. From where can I get the best picture of the Oberbaum Bridge. Where do I find the best places for the perfect sunset photo in Berlin? So I started to write down some tips for you about my favorite locations and spots you need to try for you perfect Berlin Photo experience. If you got good tips don’t hesitate to share it with me. Taken at 8:30 pm from the Elsenbridge. 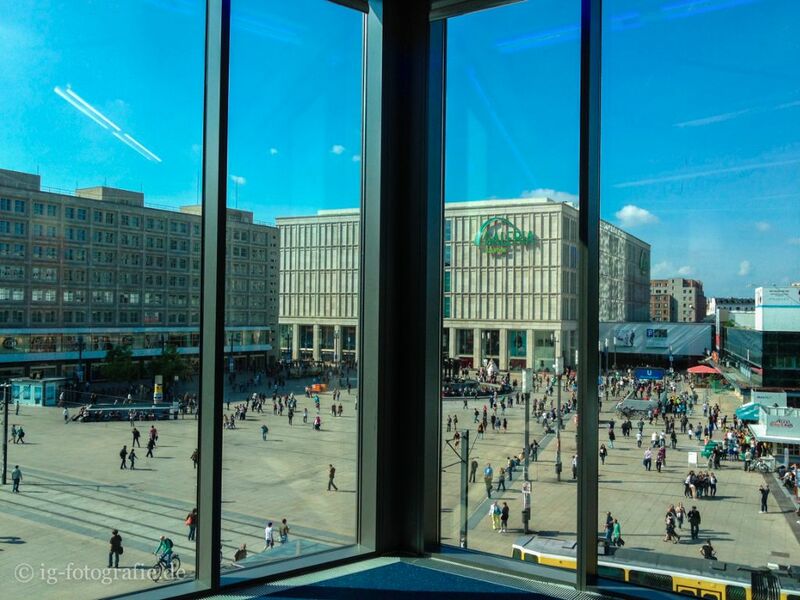 Nearly every Berliner knows this view. 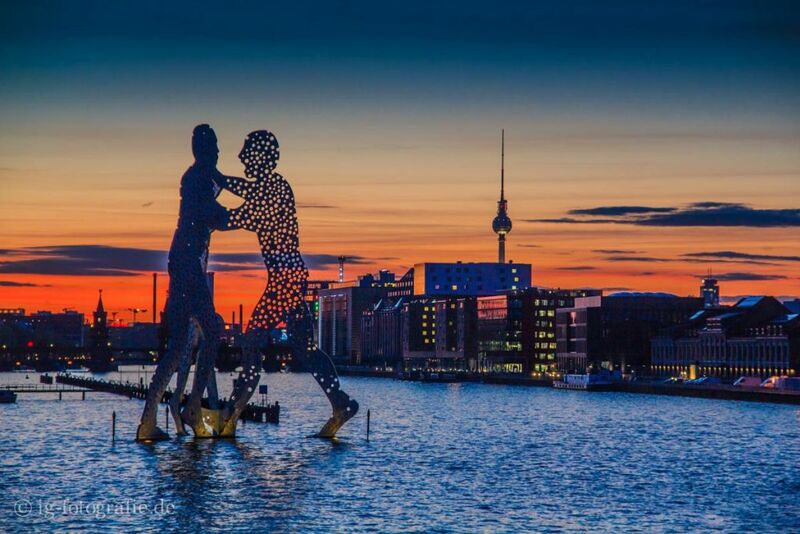 At this photo location you get the perfect view including the river Spree, the TV-Tower and the Molecule Man. If you like picture postcard photos don’t miss this location. If you want to get the bridge and the TV-Tower in your picture you should walk towards the Elsenbruecke. Here you also get the Molecule Man and the architecture around the Mediaspree in your frame. Just give it a try. Also from the side of MS Hoppetosse you will have a nice view. And I can definitely recommend coming for the blue hour. 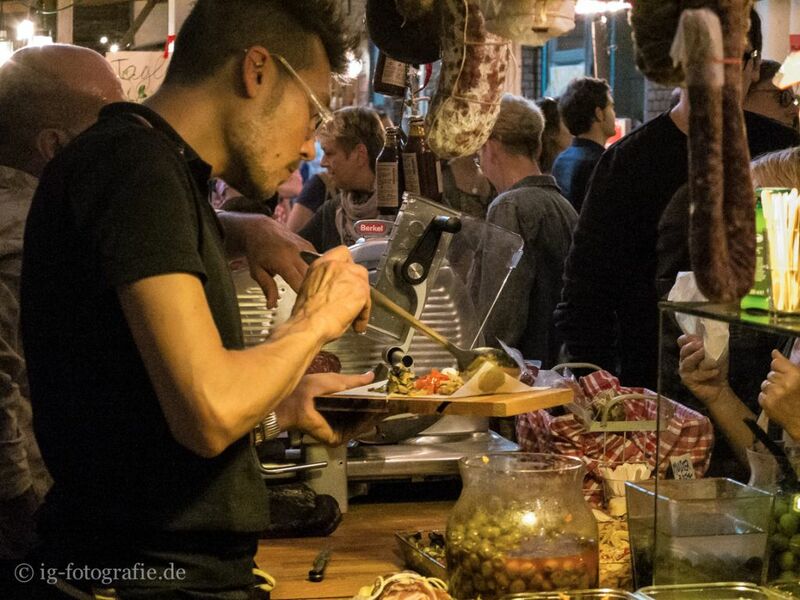 In cities like London and New York Streetfood-Markets are known for years. But you find some of these markets also in Berlin. Streetfood means fresh food and lots of small specialist from all regions of the world. Perfect for taking pictures of details, faces, wandering around and taking lots of wonderful pictures. Definitely come with lots of hunger. You’ll enjoy it! 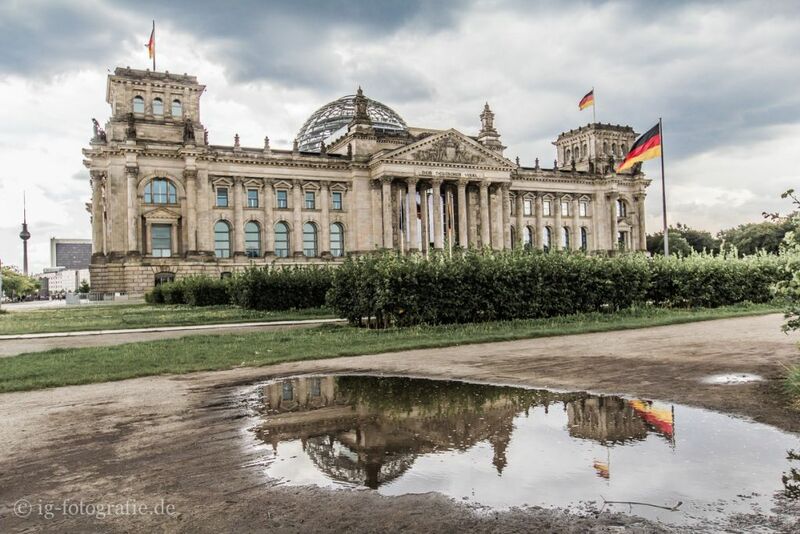 The Reichstag Berlin is one of the classics from Berlin photographers. Going up to the top of the building is a must. But bring lots of time cause here are masses of tourists. It’s open from 8am till midnight. Last entrance time is at 10pm. Also bring your ID card. It’s needed for getting into the building. Try different perspectives and views for your photos. In this picture below I was lucky cause it was right after a heavy rain. The Alexanderplatz is named after the Russian Zar Alexander I. benannte Alexanderplatz. It’s a central place, nearly build like a square and a famous traffic spot in Berlin. To my opinion not the nicest spot in Berlin but famous and maybe you find some interesting views. I can recommend the Weltzeituhr and the entrance to the train station. Go into the electronic store Saturn into the 2. level. There is a big panorama window which gives your photo a bid of George Orwell 1984 feeling. On the Gendarmenmarkt in Berlin you find the German Dom (Deutschen Dom), the French Dom (Französischen Dom) and the Concert Hall (Konzerthaus). 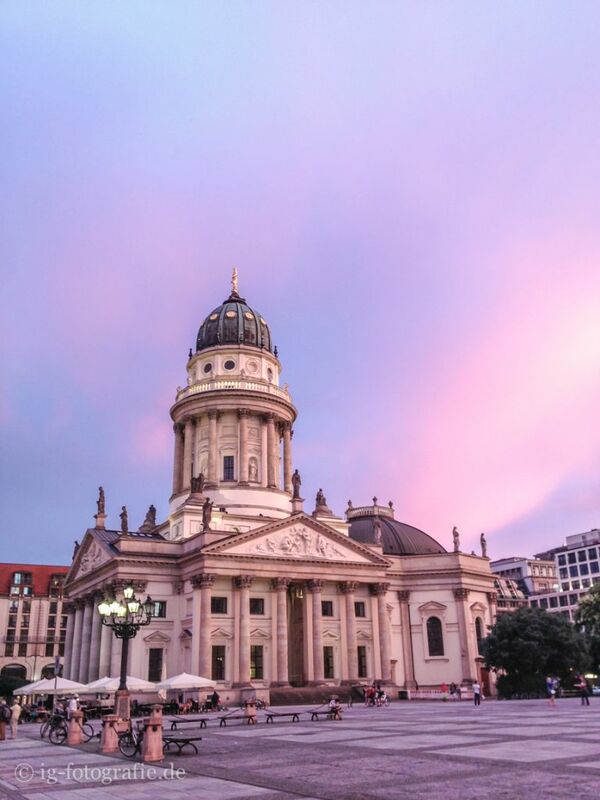 The Gendarmenmarkt is located right in the centre of Berlin (Mitten) and it’s known as one of nicest places in Berlin. I can definitely recommend to come at the blue hour or at times when it’s not that crowded. Don’t forget to bring your tripod when you come at the blue hour. 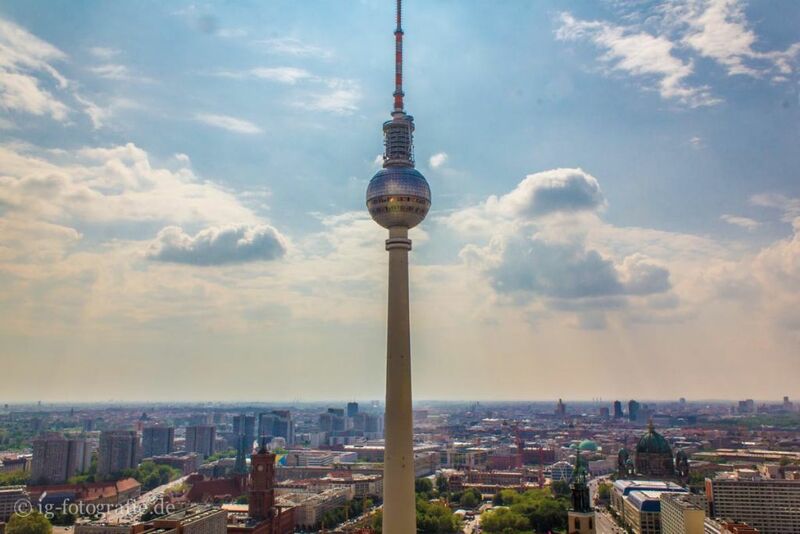 To be honest Berlin does not have a real thrilling skyline. But when I think of the skyline the first building that pops up in my mind is definitely the TV tower. But where can this big tower be photographed well? If you want to have the TV tower as the main character in your picture, you should go up the Park Inn Hotel. There is a viewing platform on the 37th floor with a direct view of the television tower. Entrance is 3 €. I recommend the wide-angle lens! For some time now the Tempelhof runway and Tempelhofer Feld has been transformed into a large park. You can go skating, have a barbecue or do other outdoor activities. Of course you can get interesting views and of course the imposing architecture of the biggest real estate in Europe. No secret, but well worth seeing. Daily tours can be found on the side or from Flughafen Tempelhof bzw. der Tempelhofer Freiheit. This is a perfect spot for all fans of impressive architecture. There is a lot of imposing columns, corridors, suites, wide angle motives and to discover more. The stadium is located in the district Westend in the district of Charlottenburg-Wilmersdorf. Construction began in 1934. The opening was on August 1, 1936. It is with 74000 places still the largest stadium in Germany. There are various tours with different topics on site. For details, can be found on the website of the Olympiastadion Berlin. Finally, there is even a place where you can try out the gray filter once. In Victoria Park on the border of Kreuzberg / Schönberg you find the man-made waterfall, the mountain works its way down. But worth the climb, the top you have a great view over the city. As the Jewish cemetery the „Jüdischer Friedhof Weißensee“ was consecrated in 1880, Weissensee was still outside the gates of Berlin. This cemetery has survived the world wars almost entirely unscathed. There are many many graves completely covered with trees and green – as in a jungle landscape. Even on sunny days you can completely sink into the green and try great light / shadow games. There is much to discover. Trees grow by graves, grave stones have fallen and overgrown, a beam of light works through the tree thicket. Long avenues invite for great photo opportunities. Appropriate dress is needed. Who has no base cap or a scarf can borrow a yarmulke at the entrance. Get secret tips of photo locations and your free photobook! Do you want to discover the best places for photography and get cool tips to improve your photography? Sign up for my free newsletter. After sign up you get a download link for my new E-Book! Great Post. I bookmarked it and will print it to take on my first Berlin trip this Nov. Thanks! Great that you liked it!